Dan Harmon — the mind behind Community, HarmonTown, and multiple other projects — is the kind of guy who’s not only overflowing with ideas, but has a very sharp focus on how to use them for maximum effect. After he co-started the monthly short film competition Channel 101 years ago, he wrote 10 rules on how to get your film rejected by the panel of judges. It’s a wonderful, expletive-laden rant filled with nuggets of wisdom for not just filmmakers but all creative types. Maybe the thing that sticks out the most, though, is the shoebox. But while the rejection portion of this is important, what he’s implicitly saying is that there is a reason why these ideas sit around for so long — they’re not worth your time. 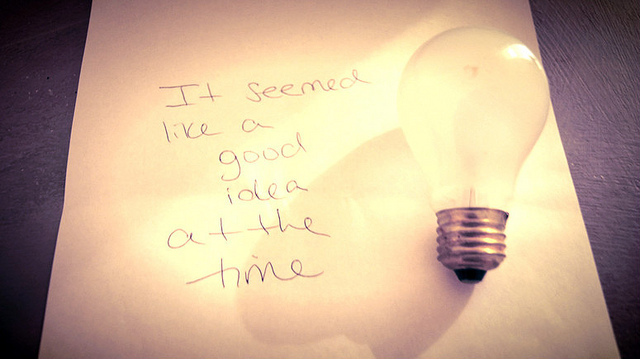 Yes, there may be that one magical idea, something that was just waiting for its moment when there was a perfect time to use it. And you’re also probably thinking right now about that one thing you slaved over for months or even years and then “temporarily” shelved. You’re thinking that sometime in the future you’ll come back to it and finish it up and finally get closure. But that is just not how creativity usually works. When we go back to some idea we were excited about five years ago, or even five months ago, some of that energy is missing. The excitement that stems from creating and discovering new things about what you’re creating has been quickly draining from that old idea. The vitality it had back then just doesn’t exist like it used to, and trying to get it moving again can end up far more disappointing than if you’d just let it go. When we go to the shoebox, we’re deciding that we’ve run out of ideas and it’s easier to pick through leftovers. But leftovers are still leftovers. And fresh is always better.